Lanthanum is the first element and prototype of the lanthanide series. [a] In the periodic table, it appears to the right of the alkaline earth metal barium and to the left of the lanthanide cerium. 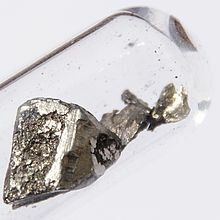 Lanthanum is often considered to be a group 3 element, along with its lighter congeners scandium and yttrium and its heavier congener, the radioactive actinium, although this classification is sometimes disputed. Similarly to scandium, yttrium, and actinium, the 57 electrons of a lanthanum atom are arranged in the configuration [Xe]5d16s2, with three valence electrons outside the noble gas core. In chemical reactions, lanthanum almost always gives up these three valence electrons from the 5d and 6s subshells to form the +3 oxidation state, achieving the stable configuration of the preceding noble gas xenon. Some lanthanum(II) compounds are also known, but they are much less stable. Among the lanthanides, lanthanum is exceptional as it does not have any 4f electrons; indeed, the sudden contraction and lowering of energy of the 4f orbital that is important for the chemistry of the lanthanides only begins to happen at cerium. Thus it is only very weakly paramagnetic, unlike the strongly paramagnetic later lanthanides (with the exceptions of the last two, ytterbium and lutetium, where the 4f shell is completely full). Furthermore, since the melting points of the trivalent lanthanides are related to the extent of hybridisation of the 6s, 5d, and 4f electrons, lanthanum has the second-lowest (after cerium) melting point among all the lanthanides: 920 °C. The lanthanides become harder as the series is traversed: as expected, lanthanum is a soft metal. Lanthanum has a relatively high resistivity of 615 nΩm at room temperature; in comparison, the value for the good conductor aluminium is only 26.50 nΩm. Lanthanum is the least volatile of the lanthanides. Like most of the lanthanides, lanthanum has a hexagonal crystal structure at room temperature. 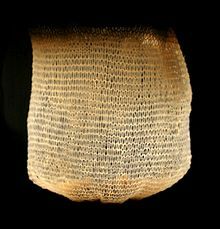 At 310 °C, lanthanum changes to a face-centered cubic structure, and at 865 °C, it changes to a body-centered cubic structure. As expected from periodic trends, lanthanum has the largest atomic radius of the lanthanides and the stable group 3 elements. Hence, it is the most reactive among them, tarnishing slowly in air and burning readily to form lanthanum(III) oxide, La2O3, which is almost as basic as calcium oxide. A centimeter-sized sample of lanthanum will corrode completely in a year as its oxide spalls off like iron rust, instead of forming a protective oxide coating like aluminium and lanthanum's lighter congeners scandium and yttrium. Lanthanum reacts with the halogens at room temperature to form the trihalides, and upon warming will form binary compounds with the nonmetals nitrogen, carbon, sulfur, phosphorus, boron, selenium, silicon and arsenic. Lanthanum reacts slowly with water to form lanthanum(III) hydroxide, La(OH)3. In dilute sulfuric acid, lanthanum readily forms the aquated tripositive ion [La(H2O)9]3+: this is colorless in aqueous solution since La3+ has no f electrons. Lanthanum is the strongest and hardest base among the lanthanides and group 3 elements, which is again expected from its being the largest of them. Naturally occurring lanthanum is made up of two isotopes, the stable 139La and the primordial long-lived radioisotope 138La. 139La is by far the most abundant, making up 99.910% of natural lanthanum: it is produced in the s-process (slow neutron capture, which occurs in low- to medium-mass stars) and the r-process (rapid neutron capture, which occurs in core-collapse supernovae). The very rare isotope 138La is one of the few primordial odd-odd nuclei, with a long half-life of 1.05×1011 years: it is one of the proton-rich p-nuclei which cannot be produced in the s- or r-processes. 138La, along with the even rarer 180mTa, is produced in the ν-process, where neutrinos interact with stable nuclei. All other lanthanum isotopes are synthetic: with the exception of 137La with a half-life of about 60,000 years, all of them have half-lives less than a day, and most have half-lives less than a minute. The isotopes 139La and 140La occur as fission products of uranium. Lanthanum oxide is a white solid that can be prepared by direct reaction of its constituent elements. Due to the large size of the La3+ ion, La2O3 adopts a hexagonal 7-coordinate structure that changes to the 6-coordinate structure of scandium oxide (Sc2O3) and yttrium oxide (Y2O3) at high temperature. When it reacts with water, lanthanum hydroxide is formed: a lot of heat is evolved in the reaction and a hissing sound is heard. Lanthanum hydroxide will react with atmospheric carbon dioxide to form the basic carbonate. Lanthanum fluoride is insoluble in water and can be used as a qualitative test for the presence of La3+. The heavier halides are all very soluble deliquescent compounds. The anhydrous halides are produced by direct reaction of their elements, as heating the hydrates causes hydrolysis: for example, heating hydrated LaCl3 produces LaOCl. Lanthanum reacts exothermically with hydrogen to produce the dihydride LaH2, a black, pyrophoric, brittle, conducting compound with the calcium fluoride structure. This is a non-stoichiometric compound, and further absorption of hydrogen is possible, with a concomitant loss of electrical conductivity, until the more salt-like LaH3 is reached. Like LaI2 and LaI, LaH2 is probably an electride compound. Due to the large ionic radius and great electropositivity of La3+, there is not much covalent contribution to its bonding and hence it has a limited coordination chemistry, like yttrium and the other lanthanides. Lanthanum oxalate does not dissolve very much in alkali-metal oxalate solutions, and [La(acac)3(H2O)2] decomposes around 500 °C. Oxygen is the most common donor atom in lanthanum complexes, which are mostly ionic and often have high coordination numbers over 6: 8 is the most characteristic, forming square antiprismatic and dodecadeltahedral structures. These high-coordinate species, reaching up to coordination number 12 with the use of chelating ligands such as in La2(SO4)3·9H2O, often have a low degree of symmetry because of stereo-chemical factors. Lanthanum chemistry tends not to involve π bonding due to the electron configuration of the element: thus its organometallic chemistry is quite limited. The best characterized organolanthanum compounds are the cyclopentadienyl complex La(C5H5)3, which is produced by reacting anhydrous LaCl3 with NaC5H5 in tetrahydrofuran, and its methyl-substituted derivatives. In 1751, the Swedish mineralogist Axel Fredrik Cronstedt discovered a heavy mineral from the mine at Bastnäs, later named cerite. Thirty years later, the fifteen-year-old Vilhelm Hisinger, from the family owning the mine, sent a sample of it to Carl Scheele, who did not find any new elements within. In 1803, after Hisinger had become an ironmaster, he returned to the mineral with Jöns Jacob Berzelius and isolated a new oxide which they named ceria after the dwarf planet Ceres, which had been discovered two years earlier. Ceria was simultaneously independently isolated in Germany by Martin Heinrich Klaproth. Between 1839 and 1843, ceria was shown to be a mixture of oxides by the Swedish surgeon and chemist Carl Gustaf Mosander, who lived in the same house as Berzelius: he separated out two other oxides which he named lanthana and didymia. He partially decomposed a sample of cerium nitrate by roasting it in air and then treating the resulting oxide with dilute nitric acid. Since lanthanum's properties differed only slightly from those of cerium, and occurred along with it in its salts, he named it from the Ancient Greek λανθάνειν [lanthanein] (lit. to lie hidden). Relatively pure lanthanum metal was first isolated in 1923. Lanthanum is the third-most abundant of all the lanthanides, making up 39 mg/kg of the Earth's crust, behind neodymium at 41.5 mg/kg and cerium at 66.5 mg/kg. It is almost three times as abundant as lead in the Earth's crust. Despite being among the so-called "rare earth metals", lanthanum is thus not rare at all, but it is historically so named because it is rarer than "common earths" such as lime and magnesia, and historically only a few deposits were known. Lanthanum is considered a rare earth metal because the process to mine it is difficult, time-consuming, and expensive. Lanthanum is rarely the dominant lanthanide found in the rare earth minerals, and in their chemical formulae it is usually preceded by cerium. Rare examples of La-dominant minerals are monazite-(La) and lanthanite-(La). The La3+ ion is similarly-sized to the early lanthanides of the cerium group (those up to samarium and europium) that immediately follow in the periodic table, and hence it tends to occur along with them in phosphate, silicate and carbonate minerals, such as monazite (MIIIPO4) and bastnäsite (MIIICO3F), where M refers to all the rare earth metals except scandium and the radioactive promethium (mostly Ce, La, and Y). Bastnäsite is usually lacking in thorium and the heavy lanthanides, and the purification of the light lanthanides from it is less involved. The ore, after being crushed and ground, is first treated with hot concentrated sulfuric acid, evolving carbon dioxide, hydrogen fluoride, and silicon tetrafluoride: the product is then dried and leached with water, leaving the early lanthanide ions, including lanthanum, in solution. The procedure for monazite, which usually contains all the rare earths as well as thorium, is more involved. Monazite, because of its magnetic properties, can be separated by repeated electromagnetic separation. After separation, it is treated with hot concentrated sulfuric acid to produce water-soluble sulfates of rare earths. The acidic filtrates are partially neutralized with sodium hydroxide to pH 3-4. Thorium precipitates out of solution as hydroxide and is removed. After that, the solution is treated with ammonium oxalate to convert rare earths to their insoluble oxalates. The oxalates are converted to oxides by annealing. The oxides are dissolved in nitric acid that excludes one of the main components, cerium, whose oxide is insoluble in HNO3. Lanthanum is separated as a double salt with ammonium nitrate by crystallization. This salt is relatively less soluble than other rare earth double salts and therefore stays in the residue. Care must be taken when handling some of the residues as they contain 228Ra, the daughter of 232Th, which is a strong gamma emitter. Lanthanum is relatively easy to extract as it has only one neighbouring lanthanide, cerium, which can be removed by making use of its ability to be oxidised to the +4 state; thereafter, lanthanum may be separated out by the historical method of fractional crystallization of La(NO3)3·2NH4NO3·4H2O, or by ion-exchange techniques when higher purity is desired. Also, pure lanthanum can be produced by electrolysis of molten mixture of anhydrous LaCl3 and NaCl or KCl at elevated temperatures. As most hybrid cars use nickel-metal hydride batteries, massive quantities of lanthanum are required for the production of hybrid automobiles. A typical hybrid automobile battery for a Toyota Prius requires 10 to 15 kilograms (22 to 33 lb) of lanthanum. As engineers push the technology to increase fuel efficiency, twice that amount of lanthanum could be required per vehicle. Hydrogen sponge alloys can contain lanthanum. These alloys are capable of storing up to 400 times their own volume of hydrogen gas in a reversible adsorption process. Heat energy is released every time they do so; therefore these alloys have possibilities in energy conservation systems. Mischmetal, a pyrophoric alloy used in lighter flints, contains 25% to 45% lanthanum. 6 are used in high-brightness, extended-life, thermionic electron emission sources for electron microscopes and Hall-effect thrusters. 3) is an essential component of a heavy fluoride glass named ZBLAN. This glass has superior transmittance in the infrared range and is therefore used for fiber-optical communication systems. Cerium-doped lanthanum bromide and lanthanum chloride are the recent inorganic scintillators, which have a combination of high light yield, best energy resolution, and fast response. Their high yield converts into superior energy resolution; moreover, the light output is very stable and quite high over a very wide range of temperatures, making it particularly attractive for high-temperature applications. These scintillators are already widely used commercially in detectors of neutrons or gamma rays. Carbon arc lamps use a mixture of rare earth elements to improve the light quality. This application, especially by the motion picture industry for studio lighting and projection, consumed about 25% of the rare-earth compounds produced until the phase out of carbon arc lamps. 3) improves the alkali resistance of glass and is used in making special optical glasses, such as infrared-absorbing glass, as well as camera and telescope lenses, because of the high refractive index and low dispersion of rare-earth glasses. Lanthanum oxide is also used as a grain-growth additive during the liquid-phase sintering of silicon nitride and zirconium diboride. Small amounts of lanthanum added to steel improves its malleability, resistance to impact, and ductility, whereas addition of lanthanum to molybdenum decreases its hardness and sensitivity to temperature variations. Small amounts of lanthanum are present in many pool products to remove the phosphates that feed algae. Lanthanum oxide additive to tungsten is used in gas tungsten arc welding electrodes, as a substitute for radioactive thorium. Various compounds of lanthanum and other rare-earth elements (oxides, chlorides, etc.) are components of various catalysis, such as petroleum cracking catalysts. Lanthanum-barium radiometric dating is used to estimate age of rocks and ores, though the technique has limited popularity. Lanthanum carbonate was approved as a medication (Fosrenol, Shire Pharmaceuticals) to absorb excess phosphate in cases of end-stage renal failure. Lanthanum fluoride is used in phosphor lamp coatings. Mixed with europium fluoride, it is also applied in the crystal membrane of fluoride ion-selective electrodes. Like horseradish peroxidase, lanthanum is used as an electron-dense tracer in molecular biology. Lanthanum-modified bentonite (or phoslock) is used to remove phosphates from water in lake treatments. Lanthanum has no known biological role in humans. The element is very poorly absorbed after oral administration and when injected its elimination is very slow. Lanthanum carbonate (Fosrenol) was approved as a phosphate binder to absorb excess phosphate in cases of end stage renal disease. While lanthanum has pharmacological effects on several receptors and ion channels, its specificity for the GABA receptor is unique among trivalent cations. Lanthanum acts at the same modulatory site on the GABA receptor as zinc, a known negative allosteric modulator. The lanthanum cation La3+ is a positive allosteric modulator at native and recombinant GABA receptors, increasing open channel time and decreasing desensitization in a subunit configuration dependent manner. Lanthanum is an essential cofactor for the methanol dehydrogenase of the methanotrophic bacterium Methylacidiphilum fumariolicum SolV, although the great chemical similarity of the lanthanides means that it may be substituted with cerium, praseodymium, or neodymium without ill effects, and with the smaller samarium, europium, or gadolinium giving no side effects other than slower growth. Lanthanum has a low to moderate level of toxicity and should be handled with care. The injection of lanthanum solutions produces hyperglycemia, low blood pressure, degeneration of the spleen and hepatic alterations. The application in carbon arc light led to the exposure of people to rare earth element oxides and fluorides, which sometimes led to pneumoconiosis. As the La3+ ion is similar in size to the Ca2+ ion, it is sometimes used as an easily traced substitute for the latter in medical studies. Lanthanum, like the other lanthanides, is known to affect human metabolism, lowering cholesterol levels, blood pressure, appetite, and risk of blood coagulation. When injected into the brain, it acts as a painkiller, similarly to morphine and other opiates, though the mechanism behind this is still unknown. ^ Lanthanum is not always considered to be a lanthanide, partly because the term "lanthanide" means "like lanthanum" and therefore logically cannot include lanthanum itself, and also because lanthanum lacks the 4f electrons characteristic of the rest of the lanthanide series. This use of the term "lanthanide" is thus limited to the fourteen elements between cerium and lutetium inclusive. ^ Greenwood, Norman N.; Earnshaw, Alan (1997). Chemistry of the Elements (2nd ed.). Butterworth-Heinemann. p. 1227. ISBN 978-0-08-037941-8. ^ a b c d e f g h i Patnaik, Pradyot (2003). Handbook of Inorganic Chemical Compounds. McGraw-Hill. pp. 444–446. ISBN 978-0-07-049439-8. Retrieved 2009-06-06. ^ a b c d e f Lide, D. R., ed. (2005). CRC Handbook of Chemistry and Physics (86th ed.). Boca Raton (FL): CRC Press. ISBN 0-8493-0486-5. ^ a b "Chemical reactions of Lanthanum". Webelements. Retrieved 2009-06-06. ^ Fukai, Y. (2005). The Metal-Hydrogen System, Basic Bulk Properties, 2d edition. Springer. ISBN 978-3-540-00494-3. ^ "The Discovery and Naming of the Rare Earths". Elements.vanderkrogt.net. Retrieved 23 June 2016. ^ Chisholm, Hugh, ed. (1911). "Lighting". Encyclopædia Britannica. 16 (11th ed.). Cambridge University Press. pp. 656–658. ^ "Inside the Nickel Metal Hydride Battery" (PDF). Archived from the original (PDF) on 2009-02-27. Retrieved 2009-06-06. ^ Tliha, M.; Mathlouthi, H.; Lamloumi, J.; Percheronguegan, A. (2007). "AB5-type hydrogen storage alloy used as anodic materials in Ni-MH batteries". Journal of Alloys and Compounds. 436 (1–2): 221–225. doi:10.1016/j.jallcom.2006.07.012. ^ "As hybrid cars gobble rare metals, shortage looms". Reuters 2009-08-31. 2009-08-31. ^ Bauerlein, P.; Antonius, C.; Loffler, J.; Kumpers, J. (2008). "Progress in high-power nickel–metal hydride batteries". Journal of Power Sources. 176 (2): 547. Bibcode:2008JPS...176..547B. doi:10.1016/j.jpowsour.2007.08.052. ^ Uchida, H. (1999). "Hydrogen solubility in rare earth based hydrogen storage alloys". International Journal of Hydrogen Energy. 24 (9): 871–877. doi:10.1016/S0360-3199(98)00161-X. ^ C. R. Hammond (2000). The Elements, in Handbook of Chemistry and Physics (81st ed.). CRC press. ISBN 978-0-8493-0481-1. ^ Jason D. Sommerville & Lyon B. King. "Effect of Cathode Position on Hall-Effect Thruster Performance and Cathode Coupling Voltage" (PDF). 43rd AIAA/ASME/SAE/ASEE Joint Propulsion Conference & Exhibit, 8–11 July 2007, Cincinnati, OH. Archived from the original (PDF) on July 20, 2011. Retrieved 2009-06-06. ^ Harrington, James A. "Infrared Fiber Optics" (PDF). Rutgers University. Archived from the original (PDF) on 2010-08-02. ^ "BrilLanCe-NxGen" (PDF). Archived from the original (PDF) on 2011-04-29. Retrieved 2009-06-06. ^ Hendrick, James B. (1985). "Rare Earth Elements and Yttrium". Mineral Facts and Problems. Bulletin 675. Bureau of Mines. p. 655. ^ Kim, K; Shim, Kwang Bo (2003). "The effect of lanthanum on the fabrication of ZrB2–ZrC composites by spark plasma sintering". Materials Characterization. 50: 31–37. doi:10.1016/S1044-5803(03)00055-X. ^ Pool Care Basics. pp. 25–26. ^ Howard B. Cary (1995). Arc welding automation. CRC Press. p. 139. ISBN 978-0-8247-9645-7. ^ Larry Jeffus. (2003). "Types of Tungsten". Welding : principles and applications. Clifton Park, N.Y.: Thomson/Delmar Learning. p. 350. ISBN 978-1-4018-1046-7. Archived from the original on 2010-09-23. ^ C. K. Gupta; Nagaiyar Krishnamurthy (2004). Extractive metallurgy of rare earths. CRC Press. p. 441. ISBN 978-0-415-33340-5. ^ S. Nakai; A. Masuda; B. Lehmann (1988). "La-Ba dating of bastnaesite" (PDF). American Mineralogist. 7: 1111. ^ a b "FDA approves Fosrenol(R) in end-stage renal disease (ESRD) patients". 28 October 2004. Retrieved 2009-06-06. ^ Chau YP; Lu KS (1995). "Investigation of the blood-ganglion barrier properties in rat sympathetic ganglia by using lanthanum ion and horseradish peroxidase as tracers". Acta Anatomica. 153 (2): 135–144. doi:10.1159/000313647. ISSN 0001-5180. PMID 8560966. ^ Hagheseresht; Wang, Shaobin; Do, D. D. (2009). "A novel lanthanum-modified bentonite, Phoslock, for phosphate removal from wastewaters". Applied Clay Science. 46 (4): 369–375. doi:10.1016/j.clay.2009.09.009. ^ Boldyreva, A. A. (2005). "Lanthanum Potentiates GABA-Activated Currents in Rat Pyramidal Neurons of CA1 Hippocampal Field". Bulletin of Experimental Biology and Medicine. 140 (4): 403–5. doi:10.1007/s10517-005-0503-z. PMID 16671565. ^ Pof. Dr. M. Zafar Iqbal. Elements in Health and Disease. Dr. Ahsan Iqbal. pp. 23–. GGKEY:KEU6L0DDWZJ. ^ Dufresne, A.; Krier, G.; Muller, J.; Case, B.; Perrault, G. (1994). "Lanthanide particles in the lung of a printer". Science of the Total Environment. 151 (3): 249–252. Bibcode:1994ScTEn.151..249D. doi:10.1016/0048-9697(94)90474-X. PMID 8085148. ^ Waring, P. M.; Watling, R. J. (1990). "Rare earth deposits in a deceased movie projectionist. A new case of rare earth pneumoconiosis". The Medical Journal of Australia. 153 (11–12): 726–30. PMID 2247001. ^ a b Emsley, John (2011). Nature's building blocks: an A-Z guide to the elements. Oxford University Press. pp. 266–77. ISBN 9780199605637. Greenwood, Norman N.; Earnshaw, Alan (1984). Chemistry of the Elements. Oxford: Pergamon Press. ISBN 978-0-08-022057-4.